CEO of Absolute Hotel Services Group Jonathan Wigley is delighted to announce the appointment of Miss Vasikan Karnchananan as the group’s Cluster Director of Sales for Asia. With 18 years of hospitality experience, Vasikan has a strong background in the national and international hospitality industry and boasts an active international network in both the MICE and leisure segments. 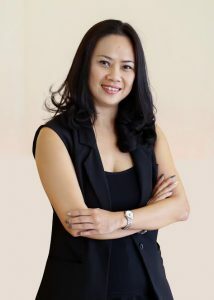 As Director of Sales for Asia she will be responsible for all aspects of Eastin Hotels and Residences and U Hotels and Resorts’ sales plans and maximizing revenue to meet the sales budget. Prior to joining Absolute Hotel Services, Vasikan was Cluster Director of Sales for the Park Hyatt Siem Reap and the Hyatt Regency Phuket Resort. “We are extremely pleased to welcome Vasikan to our team. Her teamwork, spirit and strategic vision will be an invaluable asset in achieving our company’s goals.” said Mr.Wigley.